This exquisite log home is unlike anything else in Bar Harbor. Newly built with every attention to detail and décor, it was designed to be a perfect retreat for guests with the most discriminating tastes. When you walk in you are met with a breathtaking living room and dining area with hardwood floors, a large stone fireplace, down sofa, wrought-iron chandeliers and rustic handcrafted coffee and dining tables. A two story wall of windows above the fireplace overlooks Cadillac mountain and the peaceful secluded woods surrounding the house. Double French doors open onto a wrap around deck perfect for entertaining large groups with a gas grill and outdoor seating. Inside, the beautiful brand new kitchen is furnished with every amenity including a dishwasher, microwave, gas stove, double sink with stainless steel fixtures, and an island that is open to the living room making it a perfect place to re-connect with family and friends. Walk upstairs to the alcove loft that overlooks the living area for a quiet retreat, or continue on to the master bedroom complete with a walk in closet and private balcony. The attached master bathroom has a Jacuzzi tub, double granite sinks, and stainless fixtures. The bed has a queen sized luxury superior comfort pillow top mattress. The remaining four bedrooms are equally as comfortable with the same queen sized mattresses, “log” beds, dressers, and ample closets. On the lower level is a large game room with a brand new 8 foot pool table and a foosball table, additional double French doors and a third full bath. Finally, one of the best attractions about this home is its location. The house is 3 ½ miles from the enchanting Village of Bar Harbor, Mt. Desert Island’s artistic, culinary, and social center. Located on the shores of Frenchman’s Bay, it offers the charm of a small New England fishing village with all the attractions of a major resort including restaurants, shopping, and a lively nightlife. The house also borders Acadia National Park, and is less than a mile from the Atlantic Ocean. Nearby are entrances to some of the best hiking trails in the country, as well as a huge variety of outdoor activities including canoeing, kayaking, rock climbing, deep sea fishing, sailing, biking, and much more. Also close by is the popular Sand Beach, Thunder Hole, and Cadillac Mountain, the most beautiful place to watch the sun rise in the country. 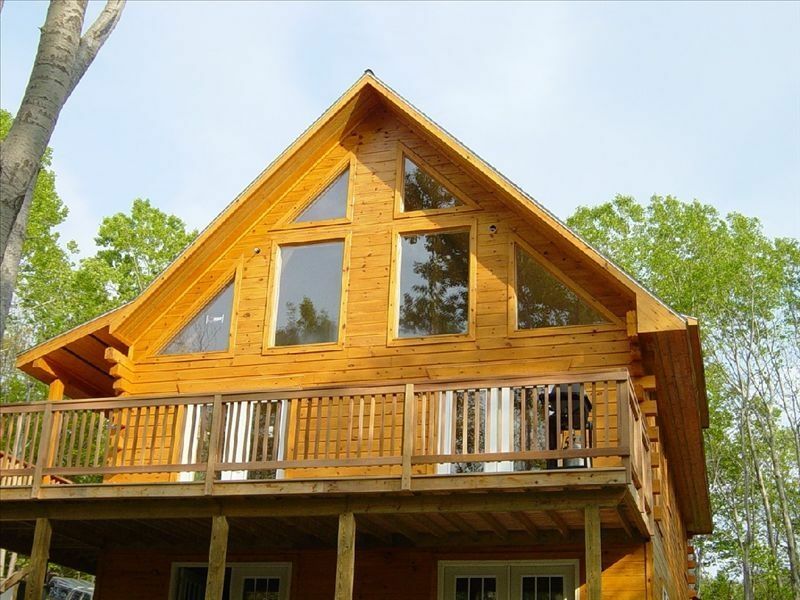 The 3-tier cabin is nestled in the woods very close to Acadia National Park. It is also logistically located to almost anything you would want to do. Everything we did, kayaking, chartering a sail boat, hiking trails, shopping and dining in the quaint town of Bar Harbor. We, especially, enjoyed the deck looking out into the woods. Great place for evening drinks and playing family games, and morning coffee and breakfast. Also, there is an area to have a small fireside chat, or visit with family members. The cabin accommodated our family of eight comfortably. Everyone had their own space. There was a pool table and a football table for team events. Would rent this property again in a heartbeat! Great family vacation in Acadia at a perfect location! My brother and I took our family's to Acadia and rented this home for a week. It was perfect! We were centrally located to the major activities. We were about a 10 minute drive into the town of Bar Harbor and about 10 minutes from Sand Beach. (Getting to Sand Beach/Beehive was about 20 minutes, because you have to drive north given the one way road into the area, but getting back after a long day was super quick!) The house had everything we needed including a BBQ on the deck that we used. There is a lobster pot in the house, which we used to prepare lobsters that we bought from Parson's (a local recommendation). At night we used the fire pit where we roasted marshmallows and hot dogs. The beds were very comfortably and linens are provided so you don't have to bring your own. I don't recall if there was central air, but we didn't need it. There are fans. Towels are provided, but I'd recommend that you bring your own. The shower on the first floor is small, and has a tendency to spritz water out of the curtain, despite pulling it closed. I'd recommend putting a towel down on the floor rather than a mat. (I found that if the mat got wet it wouldn't dry overnight, so I switched to towels.) The layout was great, especially if you have multiple kids. The one bedroom upstairs is great for a couple, the first floor has two bedrooms which is good for parents who want to be one room over from small children. The lower level was great for our teenagers with two bedrooms, a common are with a pool table, a sofa and a bathroom. Also on the first floor the kitchen opens to the deck and the living room. We did take games, but there were some in the house, so we probably could have left ours at home. Finally, the grocery store and the liquor store were right in town, about 15 minutes away. The grocery store gets crowded on the weekends, so be prepared. We're not from Maine and didn't realized that you can buy wine and alcohol in the grocery store, so you don't have to make two trips. I can't end this review without commenting on the owner, Ken. He is super responsive and helpful! This is the first time we used a VRBO and I was a little nervous about how this works. He gave clear instructions and any time I had a question, he quickly got back to me. My deposit check was returned to me within a few weeks of returning from our trip with no issue. Thank you, Ken! Wonderful Location - Needs some TLC, especially for the price! Shared the following with owner (Ken) the day after we left; never rec'd a response and now it's been 2 1/2 weeks w/ no deposit rec'd. * The location was perfect, really close to everything - the privacy of the location was perfect. * Spacious rooms, great layout with plenty of room for our 8 sisters! * The deck was very nice, plenty of seats (mesh ones were way better than ones with cushions, was raining when we arrived and it took a few days for cushions to dry out). * Pool table and foosball table was fun. * Fire pit was beautiful, just didn't get a chance to use it. * Heavy duty washer and dryer was nice. * Appreciated the wifi service. Some items that require attention. * The towels - very sparse, not in the best shape. (could have used more for 8 people). * The gas grill was very dirty. looked like it had not been cleaned in quite some time. * Flowers in hanging baskets in bad shape, we watered several times, but they need to be trimmed. - it may be unreasonable to expect guests to take care of plants. * The ice maker/ water dispenser in refrigerator is not working. expect you know about this as there were ice cube trays so had what we needed, but for the price ice machine should work. * Driveway needs reflector. very hard to see entrance, especially at night, and when when raining. suggest you place one on both sides of the telephone pole. * The screen door in master bedroom does not slide easily (off track). * Fireplace, left hand hand side felt warm to touch, but we couldn't find any controls so not sure why. Also didn't find any instructions on fireplace. Didn't need, but a bit concerning. * Light switch plate by front door also felt warm when outside light was on for extended period. * Fans - given there is no A/C, and it was very hot and muggy.. the house could use more fans and higher quality fans. Really need one in every bedroom. plus the fan in the dining room was ineffectual. * Deposit not returned in timely fashion. We appreciate the review and spoke with Trudy, realizing that we never received her email, which triggered some confusion. After connecting, we immediately addressed her concerns and made sure to remedy all of them. It was also realized that after rechecking, the security deposit was actually given back in the time allotment outlined in the contract, admitting it was just a misunderstanding. We are always striving to make the "Hiding Place" better and will continue to do so year after year. This home is in a great location. 5-10 minute drive to Bar Harbor and very close to a few Acadia National Park entrances. Plenty of space 8 adults and 3. Beautiful area surrounding the house. Everything we needed in kitchen. It was great. Would definitely want to stay there again! We stayed here with our family of 10 adults and thoroughly enjoyed it! It was wonderful to be just over a mile walk from one of the most picturesque parts of the entire park loop road. The location really couldn’t have been better for enjoying the park! The five bedrooms slept everyone easily and the three bathrooms meant no juggling to accommodate showering etc. It was a short drive into the town of Bar Harbor but with our large group we chose to cook dinner all but one night. The full kitchen made this easy. Although our weather was on the cooler side so we didn’t use the wonderful deck space, this house has great indoor and out door spaces. I would not hesitate to stay here again, and it has the bones of a 5 Star experience. (In my personal interpretation of the star rating, I give a 5 star where I wouldn’t change one thing and every thought has been given to the needs of a guest.) I wish I could use a 4.5 star rating as this property is almost there. Acadia National Park, Village of Bar Harbor, hiking, bicycling, canoeing, kayaking, deep sea fishing, sailing, whale watching, beach, CAT Ferry to Novia Scotia, shopping, fine restaurants.